I don’t know about the rest of you, but I am not comfortable about leave my belongings out in the open; I feel extremely discomfort about it. So, I am extremely aware of my surrounding and try to keep them close to me. Also I try my best to keep them clean, especially with my bags. However, during my long lectures I ended becoming lazy and placing my bag on the floor (filled with germs and bacteria). I am aware that I tend to act out whenever I am in the public – filled with germs and bacteria. My mom calls it “germaphobic” but I call it being healthy and safe. Have you ever been out in public, and had to use the restroom, and there was no where to put your bag? are all shapes, sizes and colours. “Protect your handbag: Why place your handbag on the floor where there are germs? Why place your handbag on the back of your chair when it can easily be stolen? Now you can hang your handbag from a beautifully designed hanger! Not only will this product allow easy access of your personal belongings, but is a great way to prevent the spread of germs. We carry the latest design and affordable hangers. These hangers are not ONLY for purses as they are for diaper bags, laptop bags, briefcase, etc. Our hangers are tested to hold up to 10 lbs each and we stand behind our high quality hangers. Each includes a velvet pouch for easy access as well as scratch prevention.” – From their website. 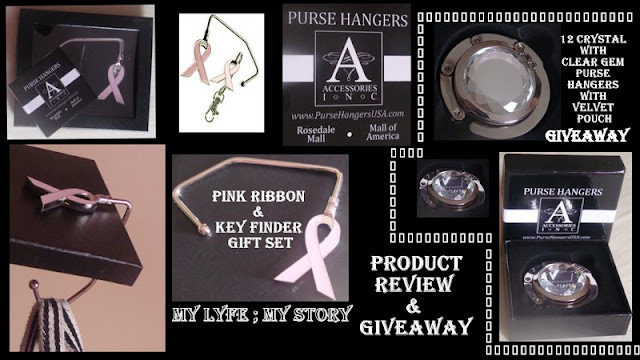 Paul from “PurseHangersUSA.com” was so sweet enough to send me the Pink Ribbon & Key Finder Gift Set. It is so beautiful and it has an amazing cause for “Breast Cancer Awareness”. This is wonderful equipment. I carry it along with me every day, especially to school. Now, I don’t have to place my tote bag on the floor. Plus, I feel really secure, since it’s so close to me and I don’t have to always keep both my eyes on my bag. The “Pink Ribbon & Matching Key Finder Gift Set” is Zinc Alloy, easily support heavy handbag more than 15lbs. Plus, it came with a cute gift box. Also, remember that all you have to do is take it out of the box, unfold it and “bam”, you can hang your bags where ever and whenever you are out in public like school or at home. Plus, your purse goes right on the hook and it stays there. Also, you will feel so much better knowing your purse will be germ free and it’s in a safe place. However, Paul & PurseHangersUSA.com has generously supplied me with a "12 Crystal with Clear Gem Purse hangers with Velvet Pouch" for one lucky reader! The PurseHangersUSA.com has graciously offered to giveaway a “12 Crystal with Clear Gem Purse hangers with Velvet Pouch” to one lucky reader of My Lyfe ; My Story. All entries must be received by 12 noon (GMT) Eastern Time (Canada) on July 20th, 2011. A winner will be chosen via random.org. The winner will be notified via email and have 48 hrs to respond. If no response with 48 hrs a new winner will be chosen. Disclaimer: I received the product from PurseHangersUSA.com for review purposes. The opinions expressed in my review are honest and my own, based on my personal experiences with the product and not influenced by monetary compensation. Does the Lindo Twist-Ω-Roll Tweezers remove hair from the root, or does it just cut it from the skin level? The Twist-Ω-Roll Tweezers removes hair from the root, the same way as waxing or threading. Does it hurt when using the Lindo Twist-Ω-Roll Tweezers? For people who regularly wax or pull hair from the root, using the Twist-Ω-Roll Tweezers is relatively painless. It feels like plucking, except using the Lindo Twist-Ω-Roll Tweezers is quicker because more than one hair at a time is removed. For people who have never removed hair from the root before, or have thicker hair on the upper-lip area, we recommend that you apply a hot towel on your skin just using the Lindo Twist-Ω-Roll Tweezers. This will help open the pores making hair removal much gentler. The towel should be hot enough to leave on for at least 2 minutes. (Take care to not burn yourself.) After using the Lindo Twist-n-Roll a few times, your skin will get used to the motion and feeling, and a hot towel application may not be needed. How does the Lindo Twist-Ω-Roll Tweezers work? When you bend the tweezers into an upside-down U shape and place it against your skin, the coil opens, positioning the facial hair between the coils. When you twist the handles, the coil gently closes and grabs the hair; through the rolling motion, the coil opens and closes, and the hair is gently pulled from the root. The Lindo Twist-Ω-Roll Tweezers works on all types of hair, including peach fuzz and coarse hair. When you use it on long, coarse hair, you'll need some patience and practice; if you can't get the long hair by rolling the tweezers on the hair, you can pull the handles to open the coil so the hair catches between the coils, and then roll it. How can I use the the Lindo Twist-Ω-Roll Tweezers on my eyebrows? The Lindo Twist-Ω-Roll Tweezers can be used only between the eyebrows and above the eyebrows. Never use it under the eyebrows because it can catch and pull your eyelashes. To use it between the eyebrows, roll from different directions to find the best angles that work for you. To use it above the eyebrows, slowly pull to open the coil to catch the hair, then roll upwards. Can I use the Lindo Twist-Ω-Roll Tweezers on other body areas? The Lindo Twist-Ω-Roll Tweezers was designed for facial hair removal, but it can be used on legs, toes, fingers, and upper arms. (It should never be used under the eyebrows.) The Lindo Twist-n-Roll always works best when you roll it against the hair-growing direction. How do I clean the Lindo Twist-Ω-Roll Tweezers? To clean it, wipe the coil with a dry paper towel to remove the hair easily. Use rubbing alcohol to wipe the coil for sanitizing. Do not rinse it under water. Does the Lindo Twist-Ω-Roll Tweezers wear out? Depending on how often it has been used and how well it has been taken care of, the Lindo Twist-Ω-Roll Tweezers can last from six months to 2 to 3 years. Generally, we recommend replacing it once a year. To avoid damaging it, do not play with it by spinning it or pulling it apart. Important: Make sure to keep the Lindo Twist-Ω-Roll Tweezers away from children. Why choose Lindo Twist-Ω-Roll Tweezers? Compared with waxing, it is less painful. It will not cause redness and breakouts. Compared with hair removal creams or bleaching, it is 100% natural, and will not cause burns or skin discoloration. Compared with the traditional threading technique, it is easier, safer, and more hygienic. Compared with plucking, it is more time efficient and quicker, and you don't have to use a mirror! How often should I use the Lindo Twist-Ω-Roll Tweezers? The Twist-Ω-Roll Tweezers is safe to use every day, but it depends on how quickly your hair grows. Some people prefer to use it weekly or monthly. These hair ties do not leave pony lines on your hair! They will not give headaches either. They holds on pretty tight and comes off smoothly. Great for sports and workouts! I have officially fallen in love with the tweezers, it really works. Plus, I mainly used it for my eyebrows rather than my face, since I barely have any baby hair (which I am thankful for). I also, purchased another Twist-Ω-Roll Tweezers for my close friend from the nearest drug store (she loves it too). The SwirlyDo hair ties from Lindo’s are cute and it doesn’t pull out any of my hair. I received the neutral hair tie packs from Facialwork.com. I really like it and it’s cute (as mention in the precious sentences). I wear them mostly to the gym =) Also, I love putting my hair up in high ponytails and this really keeps it stable and it’s come off like my regular elastic hair ties. Well, I hope all of you have a fantastic day! Plus, a huge thank you to Facialwork.com and Grace. Disclaimer: I received a Facialwork.com for review purposes. The opinions expressed in my review are honest and my own, based on my personal experiences with the products. Everyday Minerals is a website that sells mineral makeup and natural skincare. You can find a great selection of blush, eye shadow, face powder, brush and many more. I had a chance to go through their website and I am extremely overwhelmed with the amount of colours. Plus, their brush looks like it has an amazing quality. They have a huge selection of items to choose from. If you like make up, and colourful make up, I suggest you check out Everyday Minerals. Also, they have a huge collection of neutral shades. I received a few products from Everyday Minerals to try out and review. I received blush in Rhapsody in Peach, Pink Ribbon, eye shadow in Jane Eyre and eye shimmer (roll on) in In The Garden. Rhapsody in Peach is a coral pinkish color. The blush it’s self is very shimmery and it really brightened up my cheeks. Plus, the shimmer lasted for the whole day (which was nice). However, if you are not into the whole shimmery cheeks then I don’t recommend this for you. However, if you do love shimmery cheeks, then I definitely recommend this for you. Cause the my cousin actually said blush’s colour is awesome and amazing. Overall, I am not a huge blush person; however I received many comments for this specific colour. My friend actually said that this colour made my cheeks look big and cute like a princess (which made my day). everyday wear and I love it. Jane Eyre is a neutral powdered eye shadow. It's really powdery and extremely shimmery (once again). The colour is very neutral and definitely could be used for daily wear for eyes. This is something I would buy again in the near future. Plus, this neutral colour somehow makes my eyes look huge. In The Garden is a dark brownish roll on eye shadow colour. I love the roll on container – very useful and I don’t have to hunt for an eye shadow brush in the morning (saves so much time). Really pretty colour and once again this colour is also on the neutral side and could be worn daily. Overall, love all four products especially the blushes and definitely will shop in this website in the near future. A huge thank you to "Everyday Minerals" for giving me this opportunity to work with them and for giving me a chance to do a product review for them. 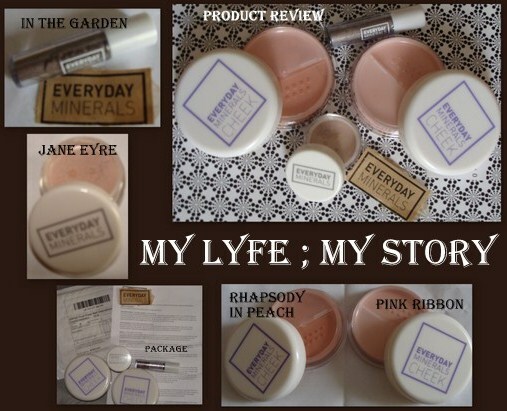 Disclaimer: I received a Everyday Minerals for review purposes. The opinions expressed in my review are honest and my own, based on my personal experiences with the products. Summer is almost here... and it’s approaching really fast! That means all my lovely female readers will be wearing cute and tighter-fitting outfits. This the perfect time to get yourself some Vedette Shapewear to help you to a flattering body shape you want. Their shapewear comes in all sorts of all styles to help you with every imaginable area of need. They have pieces that help with your stomach, legs, and other assets. Plus, they offer sizes up to 3XL. Vedette Shapewear is an undergarment designed to contour your body. 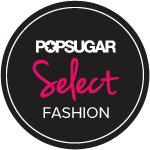 Their designers have developed the most complete line of body shapers, waist cinchers, derriere enhancers, compression garments, and post surgery girdles that provide comfort and support on a daily basis. They have specific shapewear and support garments created to focus on your problem area. If you problem area is your waist, check out the line of shapewear they have available to shape and mold your waist so it has that perfect contour. I choose their medium control corset to do a review on for my readers. The shapewear is very high quality. It’s made from a warm fabric that is soft; however it’s still very firm. It really breathable and it’s perfect for the summer. Also, they have some cute designs on them. Overall, I am in love with the product. The Vedette Shapewear has graciously offered to giveaway a “Shapewear Product” to three lucky readers of My Lyfe ; My Story. The wonderful people at Vedette Shapewear would like to offer 3 lucky readers a chance to win one of these shapewear garments. 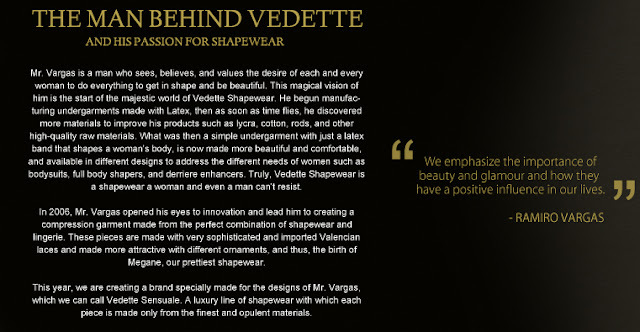 Wow, 3 winners, thank you very much Vedette Shapewear. Winner may choose from the following list ~ reflective on availability. 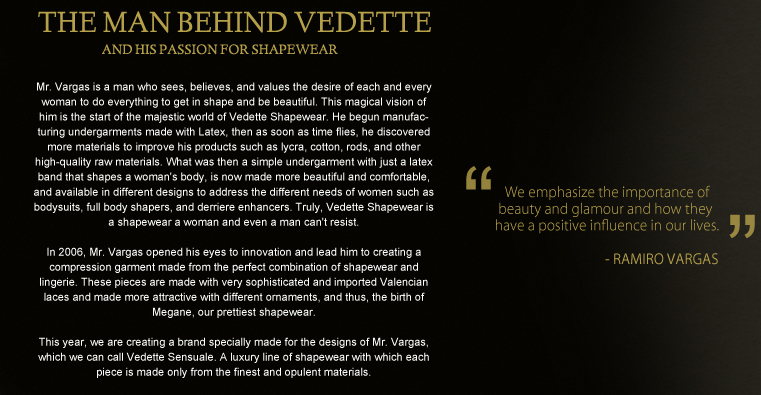 If you garment/size is not available, Vedette Shapewear will select another shapewear item for you. They are also giving a $5 Dollars coupon to all my readers, all they have to do is just to write the name of my blog (My Lyfe ; My Story) prior to purchasing any style from our website. Not only that they will also give a 10% discount to any of my readers buying the specific style which I picked for my review. 1. 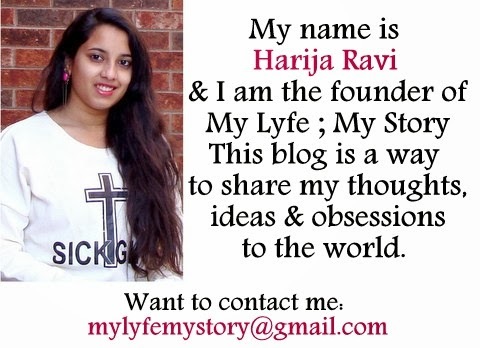 Follow MyLyfeMyStory Twitter (let me know your handle in a comment). 2. Tell others about this giveaway (Tweet, Digg, Stumble, email, forum, meme, blog it, Google Buzz, etc). You get one extra entry for each thing done. 3. Add my blog button to your blog (leave blog link). 5. Follow Vedette on Twitter and let me know your handle in a comment. 6. Follow the Vedette Blog and let me know you did in a comment. 7. Like Vedette Shapewear on Facebook and let me know in a comment. Giveaway ends on June 28th at 11:59 pm EST. All entries must be received by 12 noon (GMT) Eastern Time (Canada) on June 28th, 2011. A winner will be chosen via random.org. The winner will be notified via email and have 48 hrs to respond. If no response with 48 hrs a new winner will be chosen. Disclaimer: I received a Vedette Shapewear for review purposes. The opinions expressed in my review are honest and my own, based on my personal experiences with the product and not influenced by monetary compensation. Novica is a fantastic place to shop for gifts. They have amazing items from lovely art works to delicate jewelleries. Whether you are looking for a great and unique birthday gift ideas or a just home decor for yourself, Novica offers tons of options and choices. I just love the site and many items from the site caught my attention. I love the page on all the unique items called it "Unique Corporate Gifts". It literally has some awesome gift items for some awesome people in your life. Then I like the "Womens Robes" they have in store on their site ... it all so cool and looks comfy. Now, my most favourite item is the "Sarongs". One of my friend actually has a whole collection on these in her closet (got them from Thailand) and where them to campus on hot sunny days. And if you are an earring lover then they have a great variation of earrings to choose from like for instances the "Sterling Silver Filigree Earrings" collection. Overall, Novica site has many awesome stuff and you would definitely love it all! If you are looking for a home-based business opportunity, Novica has one: the Novica Live program. Become the authority on beautiful artisan-crafted jewelry, fashionable accessories, and world class home decor, as you take the reins on your fresh new career. With a friendly support net, fabulous products and a worthy cause, the sky is the limit! “Here's a great opportunity for you! up new consultants every week. 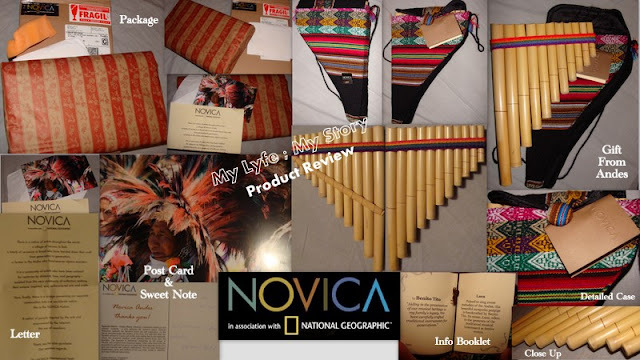 They had asked me to mention about “NOVICA Live” on the review post! Do check out their website as they have lots of interesting product and treasure with lots of uniqueness. I ended up getting a gift from Andes – it’s a special and unique gift. The service was amazing and the shipping actually was very fast than what I really expected. When I received that package I was extremely excited and the packaging was amazing. I love the musical pipes from Andes and also they send a sweet little postcard with it (plus it had a lovely message on it). It is so cool and unique. I love these types of gift and I will definitely treasure it for a long time =). Thanks to Novica for letting check out their site and also for giving me and one of my lucky readers a $30 Gift Certificate. However, Novica has generously supplied me with a "$30 Gift Certificate" for one lucky reader! Thanks, Novica! The Novica has graciously offered to giveaway a “$30 Gift Certificate” to one lucky reader of My Lyfe ; My Story. All entries must be received by 12 noon (GMT) Eastern Time (Canada) on June 30th, 2011. A winner will be chosen via random.org. The winner will be notified via email and have 48 hrs to respond. If no response with 48 hrs a new winner will be chosen. Disclaimer: I received a $30 gift certificate from Novica for review purposes. The opinions expressed in my review are honest and my own, based on my personal experiences with the product and not influenced by monetary compensation. Has anyone noticed the changes? Has anyone noticed the difference between the last year and this year? Has anyone noticed the unique and awful changes in the weather these days? Has anyone noticed the changes on this planet? Has anyone noticed the amount of disasters occurred this year so far? Has anyone noticed the death rates increasing each month? Has anyone noticed the changes at all? I have noticed the changes between last year and this year! I have noticed the unique and awful changes in the weather these days! I have noticed the changes on this planet! I have noticed the amount of disasters occurred this year so far! I have noticed the death rates increasing each month! I have noticed the changes at all! Over the past few months I take photos of unique things and view I notice... you might thing it's nothing or it worthless... but for me it means everything! 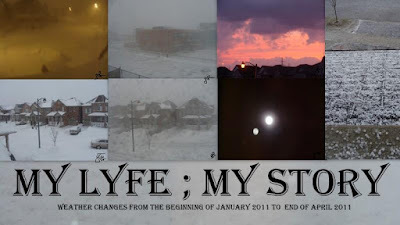 These are photos of the weather changes that occurred around my neighbourhood! "Weather changes from January 2011 to April 2011"
So yeah... today just felt like writing a post on the "changes" I noticed. Everything I wrote is from my point of view... what do you think about the changes? This is a "well" requested post by many of my readers! don't about not winning because this month I will be hosting more giveaways! Also, for being so supportive even when I don't blog often! So... what are your plans for the month of June & how did you all spend your weekend?